4. Developing a more critical consciousness about what we teach and how we teach so as to use the resources of various racial and cultural heritages in ways that are respectful and appropriate in order to avoid reproducing the assumptions of the dominant culture. 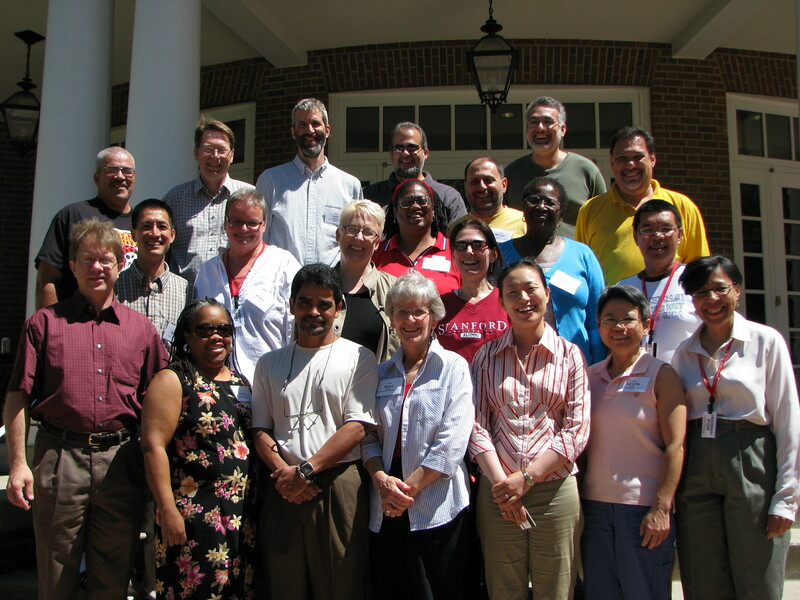 Front Row (left to right): Valerie Bridgeman Davis (Memphis Theological Seminary), *Fernando Cascante (Union – PSCE), *Nancy Ramsay (Brite Divinity School), Hee An Choi (Boston University School of Theology), Lai Ling Ngan (Truett Theological Seminary of Baylor University), Loida Martell-Otero (Palmer Theological Seminary). Second Row: *Paul Myhre (Wabash Center), Lisa Davison (Lexington Theological Seminary), Carol Lakey Hess (Claremont School of Theology), Rodolfo Nolasco (Providence Seminary). Third Row: *Tat-Siong Benny Liew (Chicago Theological Seminary), Angela Bauer-Levesque (Episcopal Divinity School), *Joan Martin (Episcopal Divinity School), Gennifer Brooks (Garrett-Evangelical Theological Seminary), Efrain Agosto (Hartford Seminary). Fourth Row: Bruce Fields (Trinity Evangelical Divinity School), Randy Litchfield (Methodist Theological School in Ohio), John Hoffmeyer (Lutheran Theological Seminary at Philadelphia), Dale Andrews (Boston University School of Theology), Michel Andraos (Catholic Theological Union of Chicago), Paul Barton (Episcopal Theological Seminary of the Southwest).